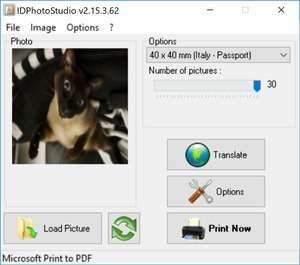 IDPhotoStudio is a basic utility application which was developed to help create photographs for ID cards and passports for different countries across the world. With regards to the user interface, IDPhotoStudio is simple and bare-bones; There's hardly any learning curve and all that is required is a proper photograph and selecting the size under options. Listed in the field are the sizes (in millimeters) and the country name. Furthermore, you can select the number of pictures to create. Version 2.15.4.63 is a freeware program which does not have restrictions and it's free so it doesn't cost anything. For security reasons, you should also check out the IDPhotoStudio download at LO4D.com which includes virus and malware tests. Additional screenshots of this application download may be available, too.